After declaring that I hated Ginger Ale as a kid, I've finally discovered a deep love for both ginger ale and ginger beer as an adult. There's a bar near our apartment that serves an extra strong ginger beer (non-alcoholic) that's used mostly in mixed drinks so that the strong ginger flavor doesn't get lost when it's mixed. But since I've become a big fan of super strong ginger flavors, I usually drink it straight out of the bottle, which makes most people cough when they try (according to both my boyfriend who frequently starts choking when takes to big a sip, and then bartenders who have all watched other people have the same reaction). 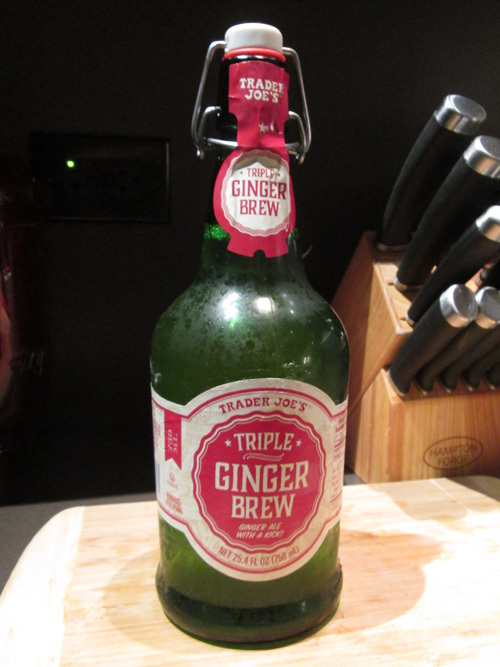 So when I saw this Triple Ginger Brew, I had to try it. I'd wanted to try some last year, but it was pulled off the shelves due to bottles exploding before I had a chance. After a year of waiting for it to come back, I was pretty psyched to finally try the ginger ale that has so much ginger flavor it's literally exploding with it, and when I did I was....a little disappointed to be honest. It's definitely got a strong ginger flavor, more so that most other ginger ales, but it didn't pack the intensity that I was expected. I was expecting something closer to Reed's Extra Ginger Brew Ginger Beer (which you can also get at Trader Joe's) that's so strong it'll tickle your nose when you drink it, and this just wasn't at that level. However, I'm also probably one of the only people who's insane enough to want a flavor that strong. If you're a normal ginger ale soda drinker who's looking for an extra ginger kick, then you'll probably love this stuff. If you're a snobby ginger-beer-with-so-much-ginger-kick-it'll-make-your-eyes-water kind of person like me though, it's probably best just to pick up some Reed's instead.